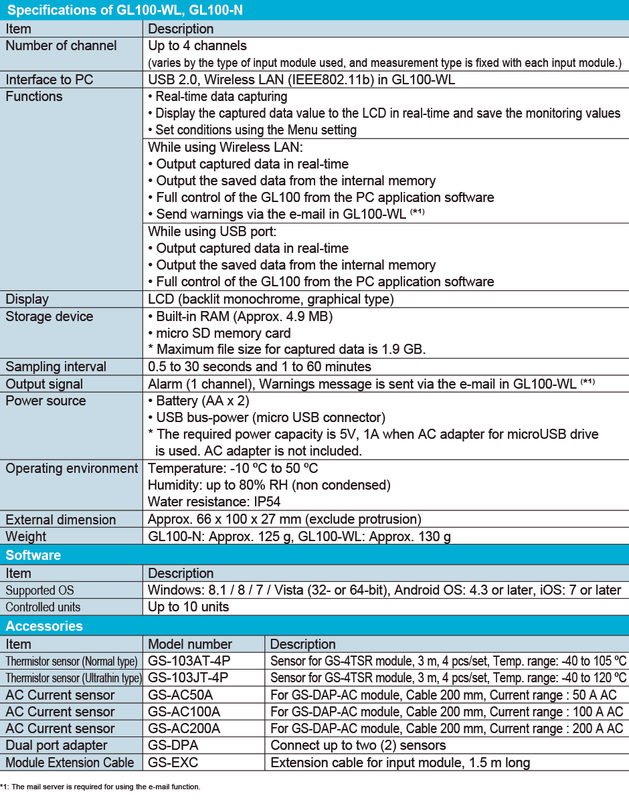 Datalogger Discovery Newsletter May 26, 2016 - Graphtec America, Inc. 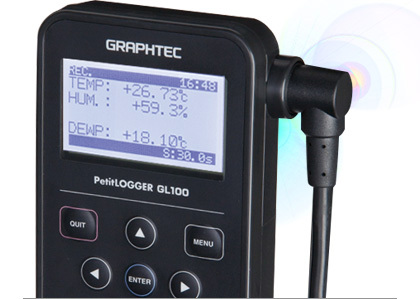 In early 2015, Graphtec announced its entry into the compact datalogger market with the GL100 series. GL100 comes wireless and non-wireless, handheld with the ability to monitor and record information for temperature (thermocouple and thermistor), humidity, light, UV, CO2, AC (50, 100, 200A), and vibration. With the ability to send alarm and emails with triggering capability, you can discover new ways to tackle your datalogging requirement. The handheld-type compact GL100 is a datalogger created to handle the wider range of simple datalogging for logistics, transportation, medical, agricultural, and retail outlet purposes. As wireless connections become more frequent and handheld-size datalogging becomes more prevalent, Graphtec built a more intuitive and simple recorder—bringing data to the palm of your hands as quickly and simply as possible. Its compact main body carries a microSD memory card slot, and the wireless (WL) main body model will allow access from smart-enabled devices like smart pads and smartphones through the Graphtec app available on iOS and Android OS platforms (available on iTunes App Store and Android apps on Google Play). 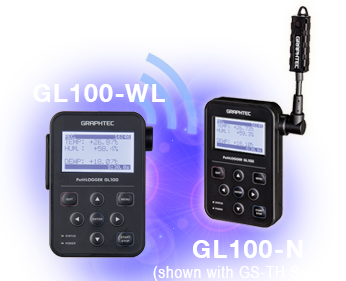 MicroUSB access to PC software for real-time recording is also offered through the GL100APS software. The sensors and adaptors are easily swappable, and with the ability to be automatically detected by the main body. 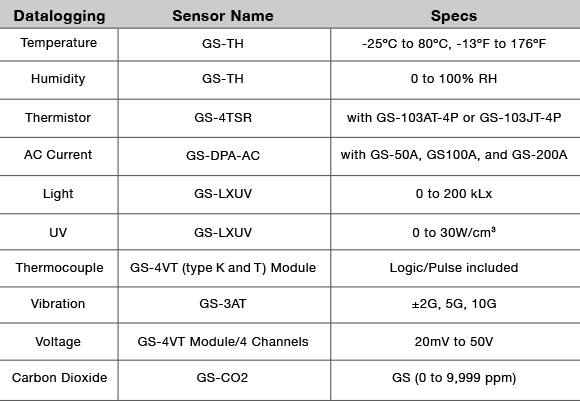 Adding the dual-port adapter (GS-DPA) gives flexibility for the following sensor combinations. The GL100-WL wireless datalogger main body has WLAN capability in setting the instrument as a terminal (or a node) in a network or as a wireless hot spot access point. This enables wireless access from notepad PC or smart pad/smartphones using only its IP address to read the real-time monitoring data and to download data from its internal memory. Additionally, the wireless LAN capability allows three different configurations for the wireless remote access. Internet connection will require the use of a global IP address offered by your network provider. Port forwarding ability using Dynamic DNS service is also available for remote monitoring. Certain threshold levels are apparent in many applications, and Graphtec GL100 will allow you to start the recording based on an alarm threshold you set it up as a numerical condition. You will also be able to set it up as a date and time stamp where recording starts and stops based on your monitoring time requirement. Q: What are the available email notifications on the GL100? GL100-WL and GL100-N automatically detects whatever sensors you swap onto the GS connector slot. Dual port adaptor GS-DPA will allow three dual sensor configuration with GS-TH, GS-LXUV, and GS-CO2. One GL100-WL main body will be able to wirelessly send information to the GL240 for four channels of direct real time monitoring and recording on the GL240. Up to 5 GL100-WL main bodies will be able to send up to 20 channels of information over to the GL840-M/GL840-WV via the wireless connection using the GL840 as the access point hub to gather all data from the GL100s in the same network. Graphtec GL-Connect application is now available for the iOS and Android OS platforms. Type in “Graphtec” on the Apple iTunes Store or the Android apps on Google Play to find the app.